Transformative moments in the cycle of life are a time for acknowledgment, a chance to guide a child's path in a positive and loving direction. 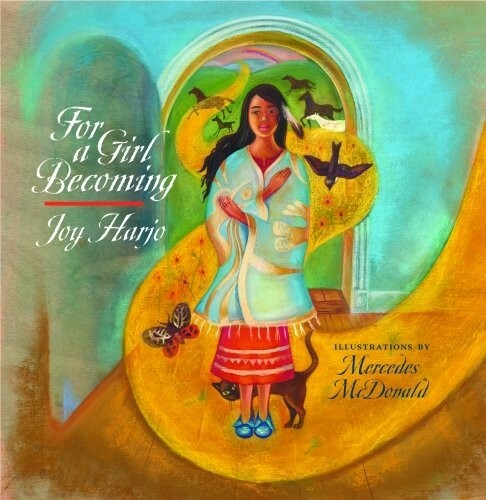 Swirling images laden with both myth and personal meaning illustrate this unique, poetic tale of the joys and lessons of a girl's journey through birth, youth, and finally adulthood. Within these colorful pages, family and community come together in celebration of her arrival, offering praise, love, and advice to help carry her forward through the many milestones to come, and reminding her always of how deeply she is cherished. It is a reminder, too, of our abiding connections to the natural world, and the cyclical nature of life as a whole. With its rich, symbolic artwork and captivating language, For a Girl Becoming is the perfect gift to recognize a birth, graduation, or any other significant moment in a young woman's life. Not only for children, this lively and touching story speaks to that part in each of us who still stands at the door of becoming.